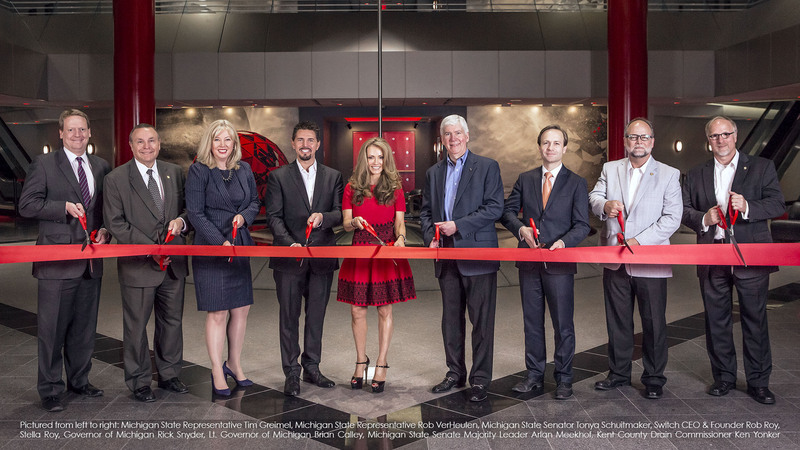 Michigan Governor Rick Snyder joined Rob and Stella Roy, and a host of the state’s political, economic development and local leadership to “cut the ribbon” marking the official grand opening of the iconic Switch PYRAMID data center in Grand Rapids, Michigan. Snyder also noted that Switch’s expansion into Michigan is a “great partnership” with the evolution of the Michigan automotive industry into a mobility industry. The massive volume of data generated and the need to provide intelligent analytics of that data will continue to grow exponentially in the next several years. Switch’s global technology ecosystem provides the mission-critical infrastructure to power the growth that is driving this age of mobility and the internet of absolutely everything. As part of Switch’s adaptive reuse of the Pyramid, a completely renovated and technologically updated meeting and event space was created on the top floor of the building. The space was used to host the event which featured products from West Michigan vendors Sweetie-licious Bakery Cafe, Madcap Coffee, Marge’s Donut Den and Applause Catering.